HARLEM — Stephanie McGraw thought she was through with abusive relationships when she found her husband. A brutal beating by a previous boyfriend had led McGraw, 49, into two years of trauma therapy and the realization that most of her relationships over the last three decades were abusive. Her husband-to-be, unlike previous boyfriends, was not involved with the street life, worked a 9-to-5 job, and owned his apartment. McGraw finally felt like a woman ready to embark on a new path. "He was good-looking and worked a regular job," she said. "He was his own man and had everything I thought I was looking for." Then the alleged verbal and psychological abuse began, McGraw recalled, with him calling her a "gold digger" and other abusive names. Stephanie McGraw founder of W.A.R.M. 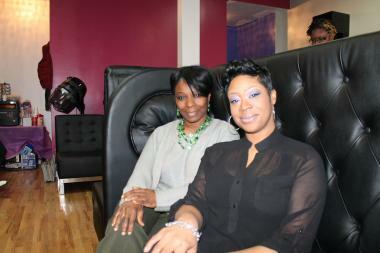 (left) has partnered with Elita Spence-Bowles, owner of Elite Conception Hair Lounge to bring women facing domestic abuse to the shop on West 144th Street between Frederick Douglass Boulevard and Adam Clayton Powell Jr. Boulevard for a day of treatment. He repeatedly kicked her out of their home, McGraw said, eventually bringing her to a new, clearer realization. "I was not going to draw anyone to me who loved me, because I didn't love myself," McGraw said. "The marriage was a manifestation of how I felt about myself. If I wanted anything better for myself, I had to change." That's when she entered trauma therapy again and emerged with the idea of starting a group to help women like herself, called We All Really Matter (W.A.R.M.). The group focuses on helping women and men to heal from the cycle of domestic abuse. Through group support sessions, self-esteem workshops and accompanying women to the hospital, doctor's office and even the beauty parlor, McGraw said she wants to help women learn to love themselves enough to end and avoid abusive relationships. She also helps men deal with the issues that cause them to become abusers. "You can't fix what you don't see," said McGraw, whose group focuses on holistic healing. W.A.R.M. also engages women in one-on-one planning of how to safely leave an abusive relationship and also refers them to organizations that provide emergency shelter. It's not uncommon for McGraw or her small staff to accompany women to court to request orders of protection or to police stations to have an abuser removed from the home. "I tell women that they called me because they are ready for action," she said. On March 13, McGraw will speak at one of the conferences sponsored by Brahma Kumaris World Spiritual University as part of the United Nation's Commission on the Status of Women. This year's meetings are focusing on violence against women and girls. The non-governmental organization holds consultative status with the United Nations Economic and Social Council. Later that night, the U.N. will come to Harlem as part of W.A.R.M's "Night of Healing" conference at Harlem Hospital. "Many of the conferences at the U.N. can feel like we are talking amongst ourselves. We wanted to bring the conversation out into the local community," said Julia Grindon-Welch, the U.N. non-governmental organization representative for the Brahma Kumaris World Spiritual University, which partnered with W.A.R.M. on the Harlem Hospital event. "Violence against women happens all over the world and the women at this conference have many stories to tell," Grindon-Welch added. "This is one of the things that can bring the two communities together." McGraw explained that the conference marks a big step for her organization, which she launched in October 2010 after leaving her husband and feeling that her story could help other women. Harlem Assemblyman Keith Wright helped the group secure a space in the neighborhood at the Goddard Riverside Community Center. Then McGraw started walking the streets, handing out fliers and going to places where she knew she'd find women, such as supermarkets, laundromats and beauty salons. Touched by her story, the women — some of whom had never told their stories before — connected with her. "Every place we went we found women in need," McGraw said. "I said to myself, 'That's why God wanted me to start W.A.R.M.'" One of those women is Sanayia Naumann, 40, an entrepreneur. She said her brother tricked her into meeting McGraw one day because he realized she was in an abusive situation, even though she didn't. "Where I lived, it was socially acceptable for this man to hit me and curse at me," Naumann said. "I felt ashamed to speak out." The relationship was affecting everything from her mental to her physical health. After attending a W.A.R.M. meeting, Naumann learned that what was happening to her was unacceptable. She was inspired to speak up after hearing McGraw's story and tales from other W.A.R.M. attendees. Soon, she was strong enough to leave her alleged abuser. "I'm just working on myself now. No dating," Naumann said. Recently, McGraw said she received a random phone call from a woman. "I'm tired," the woman, an African immigrant, told McGraw. The woman had seen one of W.A.R.M. 's fliers posted in her building. The woman was scared of leaving because of her immigration status, but feared she was in imminent danger. McGraw showed up at the woman's apartment with the police. Now, the alleged abuser is gone and the woman is working toward getting legal immigration status. "It's wonderful to see this woman taking baby steps," McGraw said. It's stories like these that fuel her long-term vision to open a transitional facility to help women heal. 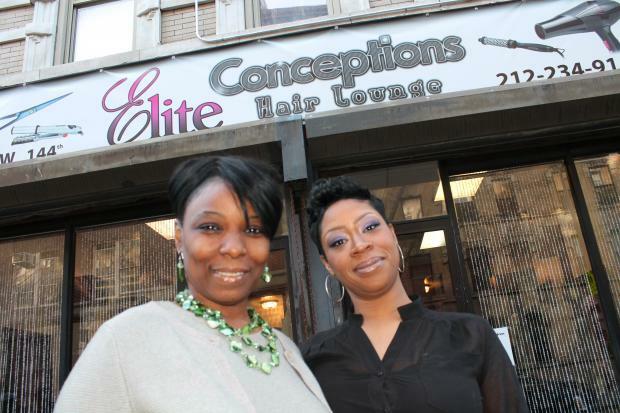 She recently partnered with Elita Spence-Bowles, owner of Elite Conception Hair Lounge, to bring women facing domestic abuse to the shop on West 144th Street between Frederick Douglass Boulevard and Adam Clayton Powell Jr. Boulevard for a day of treatment. "We deal with clientele who you can tell have been battered," Spence-Bowles said. "We are supportive and listen, but I wanted to do more." By the door sit fliers for W.A.R.M., and Spence-Bowles said she's excited to be a part of the women's healing. "We want to help get them on their feet and to prosper," she said. That's also what McGraw said she wants for women. "I tell women in an abusive situation that you don't have to do this because I've already done it for you," McGraw said. "My truth has helped to set so many women free."